Friday Dr. T. Colin Campbell of Forks Over Knives was interviewed by Bill Maher and here it is if you have 8 minutes to spare. Come on Bill, if I can afford to shop at Whole Foods, anyone can! Just avoid the pricey healthy alternatives to processed foods and stick mainly to the produce department and bulk foods section. Simple. :-) But good points on Americans really needing to be their own nutrition advocates with so much conflicting info out there. Anyway, it’s a running night and thank goodness, I need the therapy after a stressful day at work! But it also means having a good pre-run dinner that isn’t too bulky or heavy. For me that’s usually quinoa. So I cooked 1/2 cup of it stovetop while brainstorming for ideas to add flare. I wanted to spice it up and pack in as many veggies as I could. 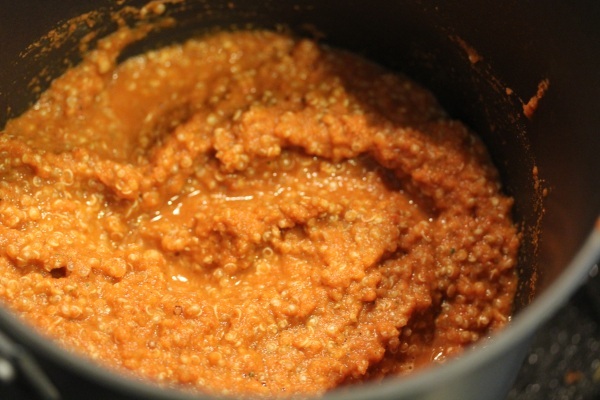 I threw together a lighter version of Nacho Hemp Sauce from Kristen Suzanne’s Hemp Recipe book. 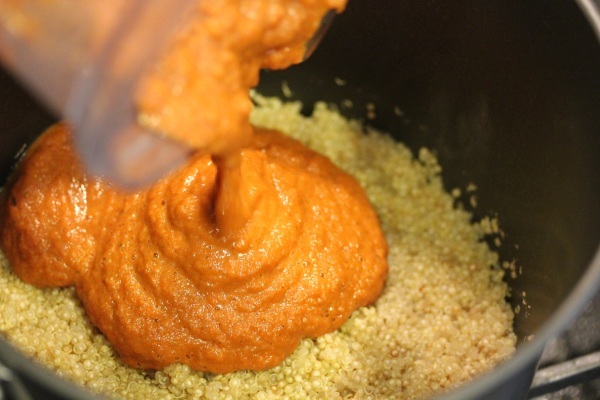 I substituted 3 medium carrots for the hemp seeds in the recipe which made a bright orange sauce with more kick. 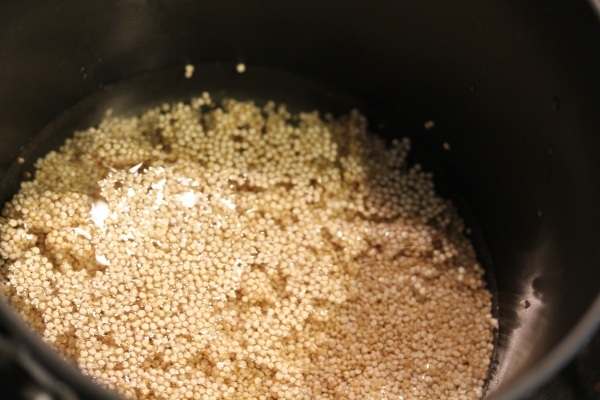 Then poured it over the cooked quinoa and simmered on low heat for about 10 minutes to blend the flavors. But it looked like it needed something more. Ah, spinach! I stuffed the pot with fresh spinach and simmered for another 5 minutes to cook it into the mixture. 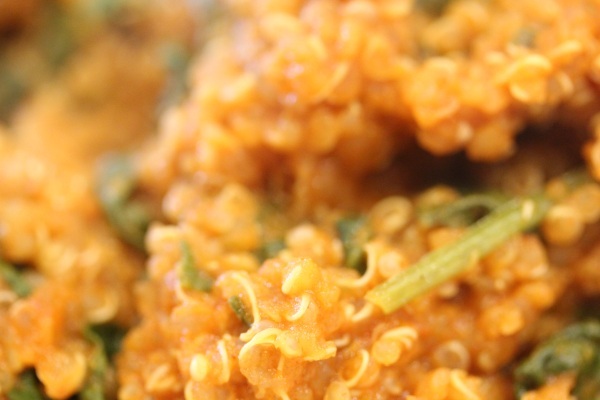 And my light, veggie-packed dinner is served adding a new flavor and texture to the quinoa. The cayenne and chili powder seasonings in the sauce added a nice punch while not being too strong and the sauce added a nice moisture to the quinoa, but it wasn’t runny. 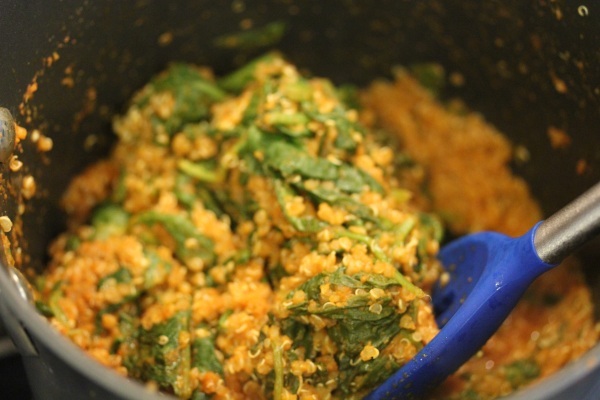 Plus there’s a lot of veggies packed into this dish for something that looks like a simple seasoned quinoa side dish. This made about 2 servings, perfect leftovers for lunch tomorrow. 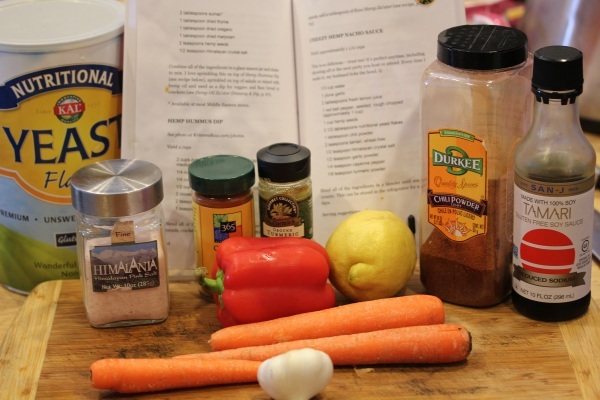 And it could be sneaky way to add more veggies for any picky eaters in the house. 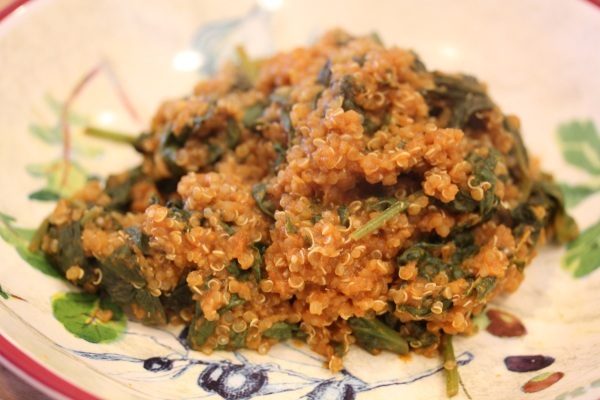 I’m loving quinoa in my summer salads. Such a light and easy to way to get in an already light food! 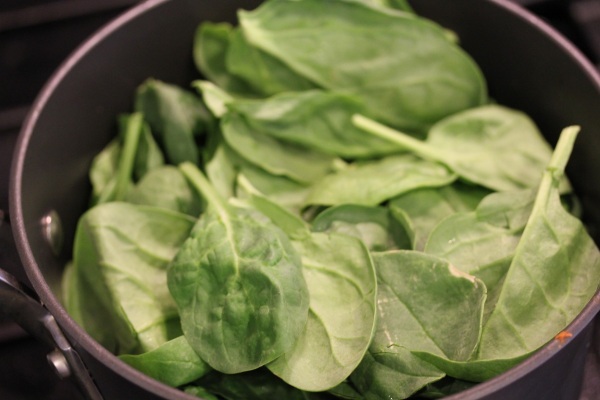 I’ve also been reading that cooked spinach is better for you than raw (your thoughts on that?) so I like how you lightly cooked them with the quinoa. YUM. 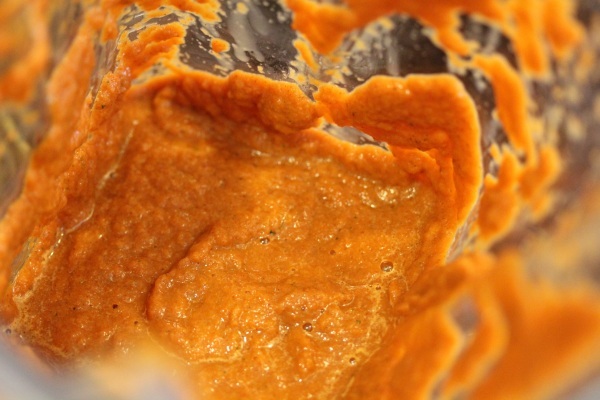 “which made a bright orange sauce with more kick.”–THAT looks awesome! love it! sneaky, picky eaters…yes! not here, really, but in general, most moms need a little help with that with their kiddos :) for me, it’s needing to sneak it in the hubs, not the kid! Reminds me of the V8 commercial with the guy just licking the dip off the broccoli and not eating it like a big kid. :-P But so many guys are like that and it’s sad! I definitely can’t afford the produce at whole foods, but I love the bulk bins for oats, flours, and nuts. As much as I don’t like shopping there, I can get a lot of my essentials (minimally processed, real food) from WalMart and that fits into my budget way better. If only there was a Trader Joe’s closer to me (it’s about 1.5-2 hours to the closest ones), I would do all of my shopping there. Though, people in NC think that Trader Joe’s is expensive – which is weird ,because I think their regular grocery stores are expensive and that TJs has pretty standard pricing.